Migration, no matter how controversial politically, makes sense economically. A new IMF study shows that, over the longer term, both high- and low-skilled workers who migrate bring benefits to their new home countries by increasing income per person and living standards. High-skilled migrants bring diverse talent and expertise, while low-skilled migrants fill essential occupations for which natives are in short supply and allow natives to be employed at higher-skilled jobs. Moreover, the gains are broadly shared by the population. It may therefore be well-worth shouldering the short-term costs to help integrate these new workers. Rhetoric surrounding migration has turned more negative in recent years. Yet, migration is not a new phenomenon. While the recent refugee surge has made it a hot-button issue, advanced economies already have a large and growing population of migrants (Chart 1). They constitute 15 to 20 percent of the working-age population in many advanced economies, and around 30 percent in some Anglo-Saxon countries such as Australia and New Zealand. Between 1990 and 2015, immigrants accounted for half of the growth in working age population of advanced economies. 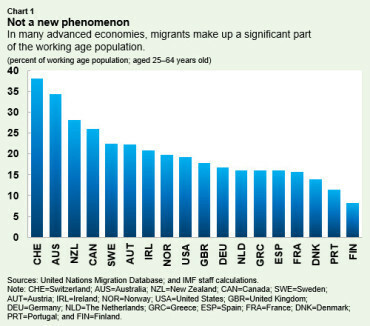 They are essential to ensure the future workforce in most advanced economies, where the working-age population would shrink over the next decade without further immigration. While the stock of low-skilled migrants has been the largest (and broadly constant in percent of adult population over time), the share of high-skilled has been on the rise. Anglo-Saxon countries tend to have a higher proportion of high-skilled migrants than continental European and Nordic countries. As migrants on average tend to be younger than their adopted country’s native-born population, they help increase the share of working age population. This is the best known channel through which migration increases income per person. But as this new study shows, it is by far not the most important one. 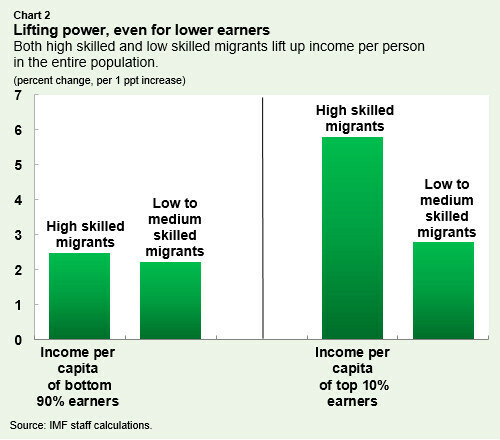 The study found that the most important channel through which the arrival of migrant workers affects income per person is by increasing labor productivity (Chart 2). c) In what is a key example of complementarity, low-skilled migrants provide housekeeping and childcare services (the “nanny effect”) and thus allow native-born women to return to work, or work longer hours. Indeed, wherever more low-skilled migrants are present, more high-skilled females participate in the labor force. Prosperity is broadly shared: An increase in the migrant share benefits the average income per person of both the bottom 90 percent and the top 10 percent of earners, even though high-skilled migration benefits more the average income of top earners. In addition, the presence of migrants does not seem to increase inequality within the bottom 90 percent of earners. Immigration can bring substantial benefits to advanced economies, in terms of higher per capita GDP and standards of living. These gains are broadly shared by the population. But the key to reaping these benefits is to address the challenges posed by migration in the short term and, in particular, to ensure migrants are integrated into the labor market. The policies to accomplish this include: language training, job search support, better recognition of the education and work experience of migrants, and lower barriers to entrepreneurship. While integrating migrants can add to fiscal cost pressures in the short run, these policies allow migrants to obtain and keep a job at a relevant skill level, and increasingly contribute to the fiscal accounts.